NEW YORK, NEW YORK – April 9, 2019 – GameChange Solar today announced Founder Andrew Worden will be participating on the panel, "Trends in Non-Developer Sources of Financing". The event will be held at the KPMG office at 345 Park Avenue in New York on Wednesday, April 10, 2019 from 8 am to 5 pm. 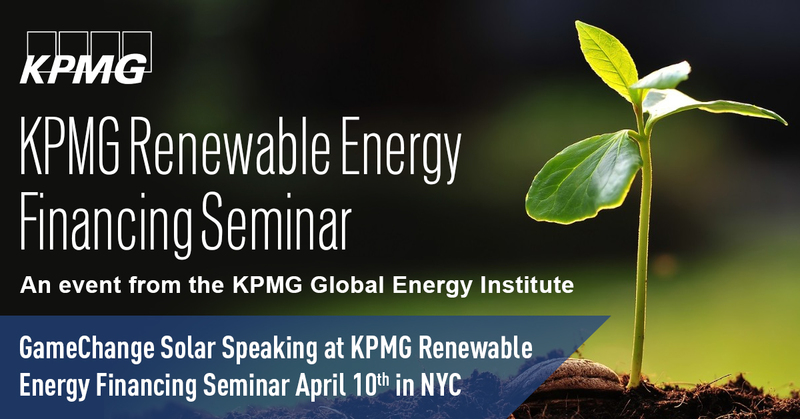 The KPMG Renewable Energy Financing Seminar is an exclusive, invitation-only event that provides participants an opportunity to interact with other executives responsible for renewable project financing from leading companies in the renewable energy development, investment, and utility sectors, as well as the financial sector.